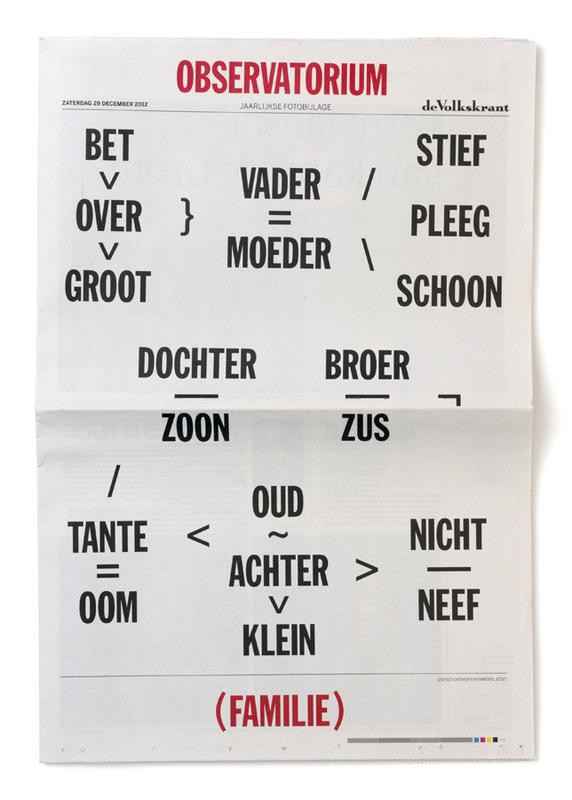 Observatorium is an annual photographic supplement that is published every year around the end of December, and appears as an insert in De Volkskrant (a daily Dutch newspaper). Each year, the photo-editors of De Volkskrant ask a different designer to create the front cover of Observatorium, according to a certain theme. 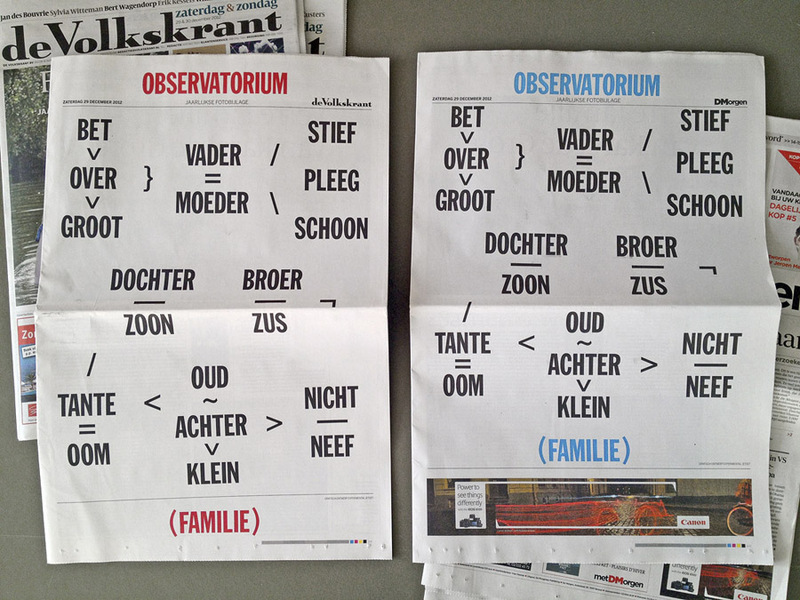 In 2012, we were asked to design that year’s cover of Observatorium; and the given theme was ‘Family’. 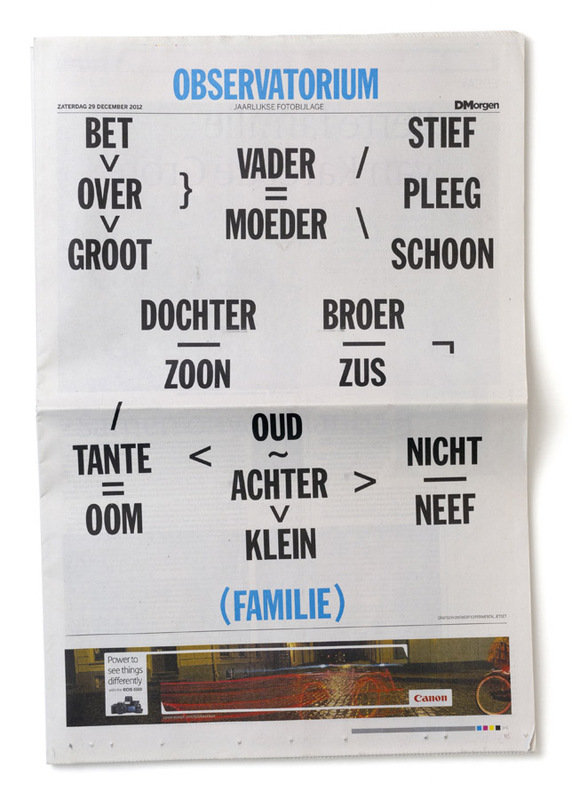 Based on the given theme, we decided to turn the front cover into a typographic ‘family tree’, using a selection of family-related words (pre- and suffixes) to create a composition not unlike a linguistic formula. We were asked to make an alternate version of the cover as well, as Observatorium would also appear as part of a Flemish newspaper called De Morgen (a ‘sister newspaper’ of De Volkskrant). This Flemish cover would include an advert at the bottom; that’s why we made this composition slightly different (we also decided to give it a different colour, to keep some distance from the colours used in the advert). Both versions of Observatorium were published on Saturday, December 29, 2012. The Dutch cover (which appeared in De Volkskrant) is the one with a red title, while the Flemish version (which was inserted in De Morgen) is the one where the title is blue. Thanks to Frank Schallmaier and the rest of the photo-editorial staff of De Volkskrant for this opportunity.